Easy to grow feminized strain, great for day-time and medicinal use. Combining Pure Kush and Afghan strains together, Black Indica seeds are a 100% Indica strain, perfect for a variety of different growing techniques. Requiring little knowledge or experience, these seeds make it very easy to grow your own high quality cannabis buds, both indoors and outside during the Summer season. Completely feminized, each seed is guaranteed to produce a perfect female plant, devoid of all male genes, expect robust, hardy plants with large leaves, dense buds and ample amounts of sticky resin. Flowering times are short at approximately 8 weeks indoors, under a 12/12 photo-period, or early September, when grown outdoors. Highly popular with medical cannabis users, the buds have a moderate THC content at approximately 13%, with a high level of CBD at 2.5%. Perfectly balanced, it provides a gentle ‘stoned’ feeling, without ‘couch-lock’. Great for relaxing and can aid sleep as well as reducing pain, arthritis and insomnia. Yields are good for a pure Indica strain, with up to 400 grams of dried, hard, dense buds possible per square meter when grown indoors using super-cropping techniques. Outdoors, given space and ambient conditions, each plant can achieve up to 200 grams, given the full eight weeks to completely mature. Sold in feminized packs of 5, 10 and 25, you can buy Black Indica seeds by clicking below. 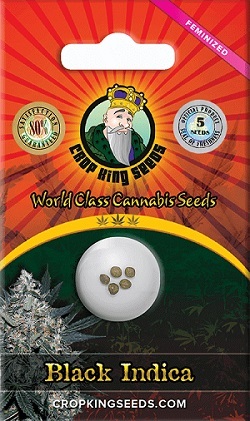 Distributed by Crop King, Canada’s leading online producer and supplier of high quality cannabis seeds, they offer the best customer support from purchase through to harvest, as well as a variety of different cannabis seeds and strains including Autoflowering seeds. Click below to find out more and buy Black Indica cannabis seeds. Buy Black Indica Feminized Seeds today and receive fast discreet shipping to Canada and all US states.